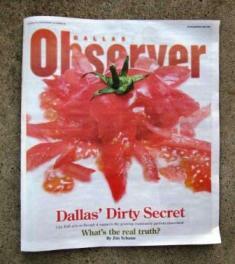 Thought you might like to see the cover story in the Observer by Jim Schutze about the state of Dallas Community Gardens. Source: www.dallasobserver.com Dallas News - The Dallas Observer is the definitive source for Dallas news coverage, politics, and blogs. From the article: Howard Garrett is a Dallas-based national radio personality and author whose thinking on organic food production, once considered radical, is now being accepted by the mainstream ("The Dirt Doctor," Dallas Observer, July 17, 2008). Methods very similar to what Garrett has preached for decades were recently adopted by Harvard University for the management of its own grounds. Locally, Garrett has served as an unpaid consultant to several groups hoping to launch community gardens. He thinks affluent people need them just as much as people who can't afford good food. "It's a convenient place for people to go and have a little plot of land where they can grow some food crops—space they don't necessarily have at home. An apartment person doesn't have space. A homeowner might not have enough sunshine." Remember to visit the Natural Organic Shop for the highest quality and best value organic products. New products have been added - check them out.